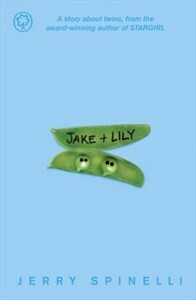 Jake and Lily are twins and they have always been close, really close. So close, that they can feel what the other one is feeling even when miles apart, and every year, on their birthday, they both sleep-walk to the same place, near to where they were born. But the summer of their eleventh birthday, everything changes. Jake makes new friends and starts going out and having fun, without Lily. Lily is distraught, and feels abandoned and rejected, and begins to spend a lot of time with their grandfather, Poppy. With his support, Lily begins a treacherous journey to find out who Lily, as a person rather than as half of “Jake and Lily”, really is. A new book by Jerry Spinelli is always a worthy of a celebration, and Jake + Lily does not disappoint. His talent for capturing the feelings and thoughts of pre-teens is incredible, particularly as he manages to soften often difficult topics with a great sense of humour. Here, using the theme of very close twins beginning to drift apart, he manages to convey so much about growing up and leaving one’s childhood behind, and how scary that can be. Lily is a wonderful character: brash, uncompromising, verging on the bully at times, but impossible not to love. Readers might be mistaken into thinking that most of the book is her story, with her struggling to cope with Jake’s newly-found independence and her difficulties at letting go. But Jake too is taken on a journey of self-discovery, once he has found his independence. He too still needs to find out who “Jake” really is. Jake + Lily is a wonderful book about what it is like to be a twin, but it will ring true for many young readers who are growing up and finding out who they are, and where they fit into the world. In the story, the care-free innocence and comfort of childhood linger, while giving a reassuring and safe glance into growing up, which will be much welcome by the targeted audience. It is simply a beautifully explored tale of growing up.